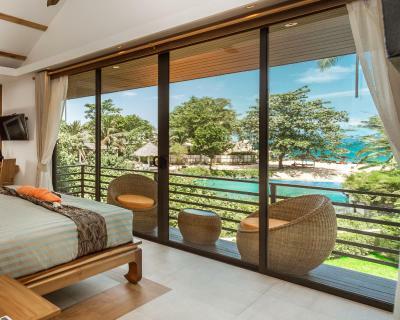 Lock in a great price for Khwan Beach Resort – Luxury Glamping and Pool Villas Samui - Adults Only - rated 9 by recent guests. Nothing was missed. Eye for the detail. Glamping at its best. Everything - the staff were all so polite and helpful from the moment we arrived. The location is a little oasis off the main road. We stayed in the most beautiful tented villa and were so sad to leave. 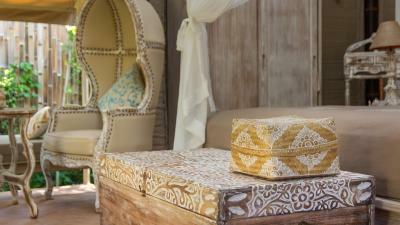 It was very comfortable and beautifully decorated. We particularly enjoyed the privacy of the gated garden area and it was quite a treat to have an open air bathroom! You must eat in the restaurant too - exquisite food and such good value for money. Friendly staff. Very nice breakfast. Good value for money if you want to have a taste of resort life with private pool yet on budget. Everything was fantastic. 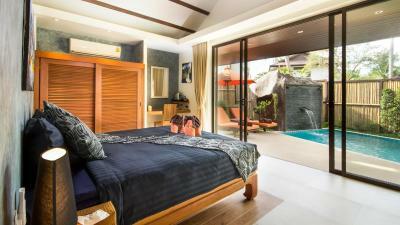 Beautiful room and comfortable beds with luxury amenities and private pool. The nicest place I have ever stayed and good value too. The place was beautiful, clean and the staff was great. They offered mosquito repellent in every villa which I found very thoughtfull. Adults only quiet stunning pool area had it to ourselves for a lot of the time. 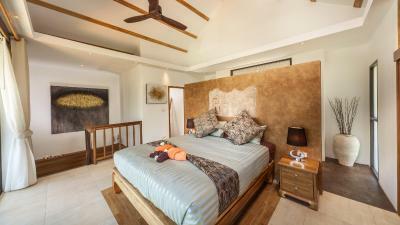 Staff, Private pool villa, glamping, food, everything is perfect. Private pool villas are completely private. Chula (the manager) , the rest of staff, and even the owner are great and made me feel at home. Tents, gardens, grounds and resturant all beautiful. One of our top picks in Mae Nam.Located only 50 yards from Mae Nam Beach, Khwan Beach Resort offers high-end in-villa and a glamping area as well as art gallery within the resort. It boasts an outdoor private pool and a spacious garden. 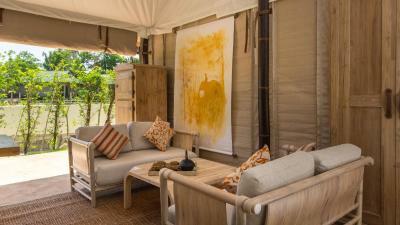 This accommodation offers elegant private pool villas and luxury tents with free parking space and free WiFi. Featuring Thai Art and Modern Design, all pool villas and luxury tents are comprised of a living area fitted with entertainment media, a comfortable sofa set and garden views. Some units also come with a private pool and a fully-equipped kitchen, supplied with modern cooking facilities and a dining table. Free toiletries are provided in the private bathrooms. At Khwan Beach Resort, guests can sit back and relax in the sun loungers by the pool or spend time in the well-preserved garden. Massage and spa treatments can be enjoyed in-villa. For additional convenience, the guests can approach the property for car hiring. A continental breakfast is served daily from 07:30 to 11:00 hrs at the villa or restaurant. In-villa fine dining menus featuring French and Thai cuisines are also available. Local and international restaurants, as well as nightlight entertainment, at Maenam's centre can be reached within 200 yards from the accommodation. A 24-hour convenience store is 150 yards away. Attractions in the surrounding of Resort Khwan Beach include the Maenam Night Market on every Thursday nights, Fisherman's Village (2.4 miles). 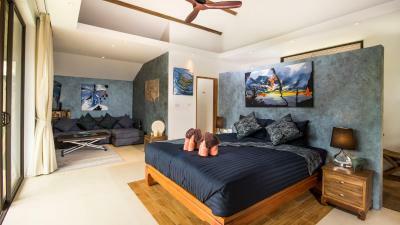 Mae Nam Pier is 0.9 miles away while Samui Airport is located 4.3 miles from the property. This is our guests' favourite part of Mae Nam, according to independent reviews. 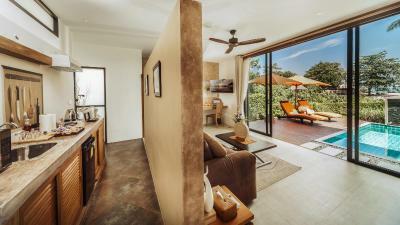 This property is also rated for the best value in Mae Nam! Guests are getting more for their money when compared to other properties in this city. Khwan Beach Resort – Luxury Glamping and Pool Villas Samui - Adults Only has been welcoming Booking.com guests since 19 Jan 2015. 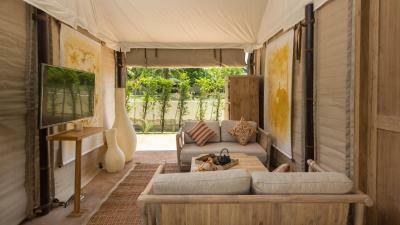 When would you like to stay at Khwan Beach Resort – Luxury Glamping and Pool Villas Samui - Adults Only? The 2-storey villa boasts 135 sqm of living space and comes with a private pool, a balcony and river views. 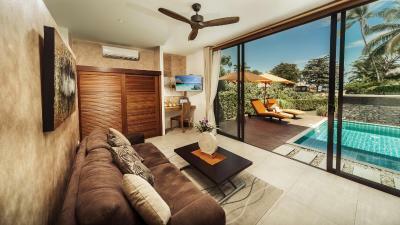 The living room is fitted with entertainment media, a comfortable sofa set and has pool views. The fully-equipped kitchen is supplied with modern cooking facilities and a dining table. Free toiletries are provided in the en suite bathroom. Offering 75-sqm of living space, the villa comes with a private pool and garden area. 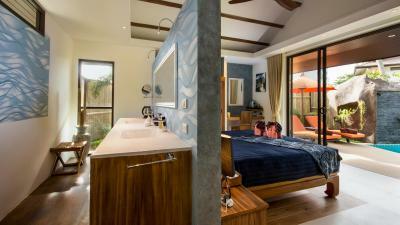 It includes a large bathroom and a living area equipped with entertainment media, a comfortable sofa set. Free toiletries are provided in the en suite bathroom. 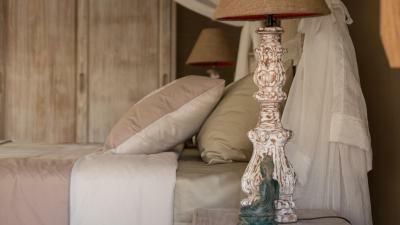 The tented villa offers 45 sqm of living space, a King-sized bed and a living room fitted with multimedia devices. It also includes a swing sofa and a private and furnished terrace. The partially open bathroom comes with a bathtub and luxury toiletries. Offering 110-sqm with two bedrooms, the Luxury Two-Bedroom Tent comes with a spacious living area and a semi-outdoor shower room. This air-conditioned unit also includes a flat-screen TV, a swing sofa and a ceiling fan. The partially open bathroom comes with a bathtub and luxury toiletries. 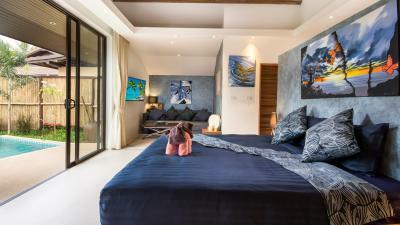 House rules Khwan Beach Resort – Luxury Glamping and Pool Villas Samui - Adults Only takes special requests - add in the next step! Khwan Beach Resort – Luxury Glamping and Pool Villas Samui - Adults Only accepts these cards and reserves the right to temporarily hold an amount prior to arrival. The location is a lil bit remote, quite far away from main sites. The room is a little bit broken down when we first moved in. The air con was not cool enough, the television was hard to turn on, the faucet was not working too. I really appreciated the hard work of the staff fixing all these. Yet, the low water pressure was the main problem. The staff were amazing , so friendly and kind . We liked our place a lot. Some details: some body lotion and conditioner in the toiletries offered would have been nice. They DID offer mosquito repellent though. And the mosquitoes were a bit annoying, it was impossible for me to sit at the pool area after the sun went down. Hi, first things first a hotel was really nice, everything looks like on the picture. Stuff was helpful and kind and everything was still clean, but one thing happened which we can’t overlook and I dont want to blame anyone but somebody stole our money. We came from dinner to our a tent for money which we put to a vault, because we wanted to change some. So we decided to count them first and we figured it out that both of us was missing 50€ (we had money separately in 2 wallets). We thought that we bought something earlier at the airport, so we decided to make a list how much we have and how many euro bills we had from each one. Another day came and we locked our money to safe again and we went to the beach. We came back and we counted our money... And another 20€ was missing. It was our last night in this hotel so we decided to wait until the morning. During the checkout we told our problem to one of the employee but she said that no ones has key from safe and if somebody tried to unlock it he has just 3 tries. And she was still repeating that so we couldn’t do anything and we had an option to call a police but anyway we didn’t because we knew that it wouldn’t make sense to bother them. So people be careful and try to keep your valuables with you and don’t trusts safes. I hope it will help some people. The only thing that is not perfect is that the resort is not directly on the beach. But on the other hand, to get to the beach you walk only 1 minute through the beautiful tree archway. Our first tent bamboo was right next to the building work and at 7.45am work started each morning. Not the peaceful setting i imagined. What i cant understand is when i have read reviews lots of people have complained about the same thing! Why not offer this tent at a cheaper rate because of the building site next to it. We were moved after 2 nights but that isnt the point it was still a pain to pack up. The sinks were really terrible, last day the toilet was blocked. I believe that the bathroom, sink area can be much much better as it seems very cheap and not convenient. Shower room was full of mosquitos. Its alot of money for all these down points.